‘The Soul Miners?... Never less than the best! – Peter Karrie, Internationally renowned Singer and Star of Musical Theatre. ‘When we started planning our wedding, we both knew we wanted a soul band and although we'd never seen The Soul Miners perform, we went with the recommendation of a friend. I can't tell you how glad I am that we listened! The energy these guys give to every single song is just unbelievable! Their vocals are insane and I can't even describe in words how talented the musicians are. The dance floor didn’t stop rocking from the first, till the last track and all our guests have not stopped talking about "The Band". ​On top of this, all the band members were so lovely taking the time to congratulate us and chat with our guests. I can honestly say that booking The Soul Miners was the best decision I made (apart from saying Yes of course!). Thank you so much guys for making our wedding one to remember. You are quite simply amazing.' – Mr & Mrs St Leger, Caerhyn Farm Venue, Llangadog, Carmarthenshire, wedding. The Soul Miners are a 100% live, 8-piece, high-energy, soul band, who specialise in performing classic Motown & Stax soul music. We are based in Cardiff, Wales, and are available to perform throughout the UK. Since our first gig in 2007, we have performed at hundreds of events. From a house party to a festival – we’ll fit right in! Weddings in particular are our speciality. Our musicians and vocalists all share a deep love of soul music, and we believe our enthusiasm for performing together shows in our performances - we like to have FUN! We are not a cabaret band just going through the motions! Our repertoire features songs by legendary soul artists such as Aretha Franklin, James Brown, Stevie Wonder, and Ray Charles. Many of the songs from the films ‘The Blues Brothers’ and ‘The Commitments’ are in our sets, as we know how much our audiences love to dance and sing along to them! Great fun, and perfect entertainment for any event. 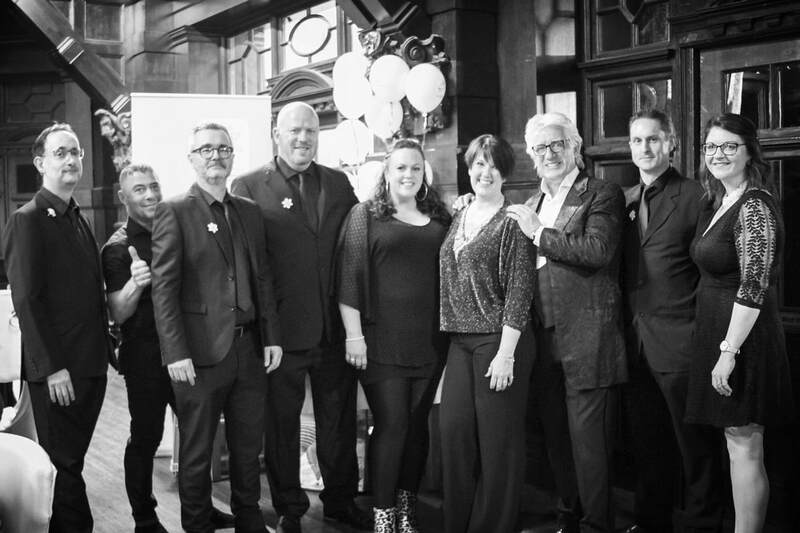 The Soul Miners with West End star Peter Karrie at a fundraising ball held in support of Marie Curie at The Coal Exchange, Cardiff. More live performance videos can be viewed here. - Clare and Ant, Oldwalls, Gower, wedding. Celtic Manor Hotel Resort, Newport. ​The National Museum of Wales, Cardiff. St Fagans National Museum of History, Cardiff. The Temple of Peace and Health, Cardiff. The Webbington Hotel, near Weston-super-Mare. The King Arthur Hotel, Gower. Peterstone Court , near Brecon. The New House Country Hotel, Cardiff. The Corran Resort & Spa, Laugharne. The Royal Welsh College of Music and Drama, Cardiff. The Angel Hotel , Cardiff. De Courceys Manor, Pentyrch, Cardiff. St Donat’s Castle, St Donat’s. Cottrell Park Golf Resort , Cardiff. St Pierre Hotel & Country Club, Chepstow. The National Museum of History, Cardiff. The Barn At West Farm, Southerndown. Our line-up features three vocalists (one male and two females) all of whom perform lead and backing vocals, sing duets, and harmonise together. This makes our sets appeal to a very wide audience. Our dedicated professional audio engineer always ensures we have the best possible sound to put on a great show, and we only use top quality instrumentation, amplification, and lighting equipment. With sets packed full with great tunes, and a tight and talented band of soul aficionados, we will make sure that you and your guests get up, and stay up, dancing all night long! Visit our YouTube channel for more videos of The Soul Miners performing live. Follow the link below. All our YouTube videos feature a 100% LIVE PERFORMANCE of the band recorded in front of a public audience. No edits, overdubs, or pre-recorded audio tracks!